Don’t tell Stefon, but New York’s hottest club is… on your couch, with a couple glasses of Saturday Night Live Chardonnay. And you don’t even actually have to be in NYC to enjoy it, because the legendary late-night sketch show has just unleashed its own collection of wines online, boasting a handful of varietals inspired by some of its most iconic characters and sketches. The limited-edition lineup, which SNL created in partnership with the vino experts at Lot 18 wines, features four handcrafted wines. There’s a 2016 Debbie Downer South Eastern Chardonnay, a 2015 The Californians Monterey County Merlot, a 2016 Stefon Beaujolais, and a 2016 Saturday Night Live California Red Blend. 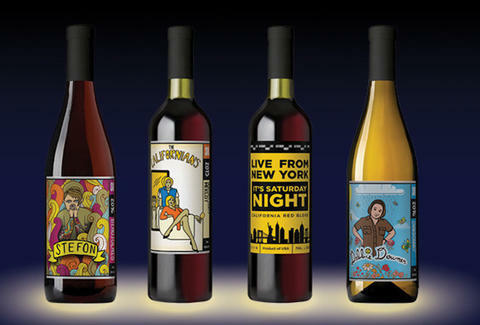 Each bottle also rocks a special, artfully illustrated label celebrating whatever character or sketch it's named for. All four bottles are available for $20 or less apiece, though if you’re buying for your "Drunk Uncle," you can also buy them by the case. Catching up on the latest SNL episode while sipping isn’t necessary, but it is recommended.